E.T.A. Sotherton is currently on sale for 30% off at Interweave's site, along with An Aran for Anne, An Aran for Frederick, and Bixby. It's been a little emotional over here of late, and I haven't felt like posting. Plus, I'm working hard on two deadline projects. But today may be the last chilly day in New York, so I'm celebrating by wearing (and talking about) Sotherton in my latest video, which I have also uploaded to YouTube - we'll see if I can make this work. I misspoke there about using tosh dk - the sample I'm wearing was worked in tosh vintage. If you follow the link in the first paragraph, you will be able to browse all the Sothertons on Ravelry. It is a sweater that flatters many figures. If you haven't made one yet, why not? 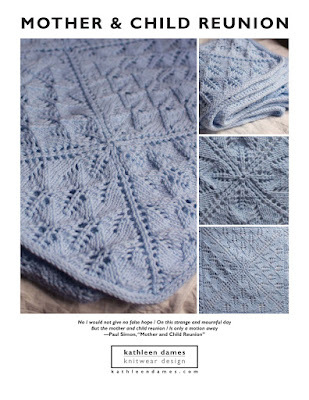 :) That link will also link you to the Interweave store where you can get your own copy of the pattern. Out of curiosity, would people be interested in my self-publishing the pattern (and any other Jane Austen Knits patterns)? It would mean the patterns would be available from Ravelry/Etsy/Craftsy. I know some knitters like to keep all their patterns together in their Ravelry libraries. Comment or drop me an email at kathleendames at gmail dot com. Since this would take some extra work on my part, I only want to do it if it would be of some worth to people. Thanks for watching/reading, and happy knitting! So, I made another video today and hope you will be able to see it (I'm still figuring this stuff out and have yet to actually edit any video, so apologies if you find me a little ramble-y, or if the file is huge - still not sure what is normal/acceptable). I am wearing Mermaid's Cardigan here and talked a little bit about it's structure and the perils of hand-dyed yarn. By it's very nature hand-dyed yarn is imperfect, and that's one of the things I love about it. Just be sure to alternate skeins as you work, even if you are sure you have chosen the matchiest skeins in your LYS. Since I got so chatty about the sweater, I didn't have a chance to talk about the class I'm teaching, which I believe I've mentioned before. Isobel, Stephen, and four of their friends from Isobel's grade come over after school every Thursday to learn how to knit. We have mastered knitting, binding off, casting on, and now purling! Many people find purling difficult, and I think that comes from spending too much time learning to knit and building up that muscle memory until it becomes so ingrained that purling doesn't make sense. We got to purling yesterday at just the right time. Everyone was moderately comfortable with their yarn and needles, so purling just became a new move. Stephen even claimed that he found purling easier, which I loved to hear. Perhaps because I am a thrower I find that I am not purl-averse. Or perhaps it's because my friend Emily, after our wrassling with casting on for so long, taught me to purl soon after I mastered the knit stitch. It really is beneficial to learn them close together and master both to avoid self-imposed limitations on what you'll knit. You don't want to knit garter-stitch rectangles and stockinette tubes all your days, do you?